I have the cutest photo to share with you today! 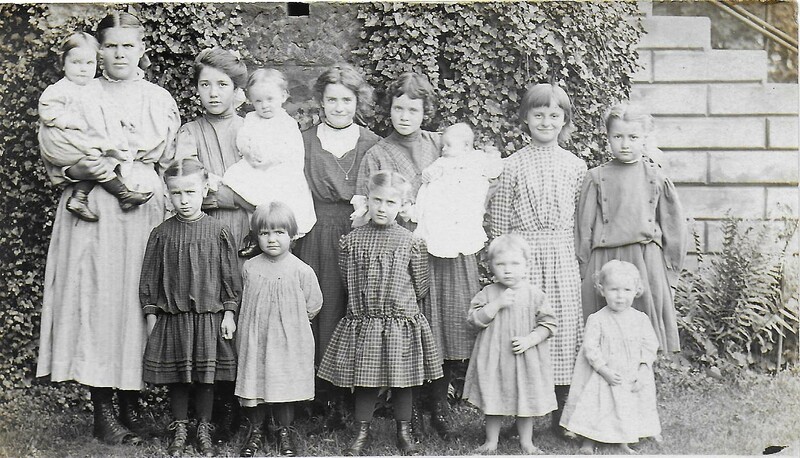 Fourteen children evidently born one just after the other! Can you imagine all those little boots lined up at night! The oldest is possibly fifteen or sixteen – the others are stairsteps down the line to the infant held by one of the girls. All the older children are girls – it is always harder to tell with the little ones since they were usually dressed the same from about three or four and younger. Do you think their mother made their clothes? This is a postcard photo. On back, in the area where it says ‘Place stamp here’, in the corners around it are four triangles, face up, with AZO in lettering, on each side, between the triangles. This actually tells the postcard stock used. This particular paper was from Eastman Kodak, and was used for 1904-1918. What a wonderful glimpse of a bygone era!